A key component to healthy paddling is coming back alive. It's pretty hard to be healthy (or fit for that matter) once you've shed your mortal coil. All reports indicate that dying is very spiritual. But no need to rush into it! The most dangerous thing about sea kayaking is that, unlike whitewater kayaking, it looks so easy! Not many people watching kayakers on a river would decide to go out and run a river without training. Something about all that gear—the helmets and lifejackets. It looks difficult, and the average person watching them thinks, "I'd better take a course and buy a brain bucket". We tend to think of fun and safety as opposite ends of a continuum. You know—wearing a lifejacket is safe, but paddling without one is fun! Wearing a wetsuit is safe, but paddling naked is fun! Taking along all the extra safety gear is safe… etc. I have come to think of fun and safety as two sides of the same coin. Anyone who has had a near-death experience knows that nearly dying is not fun! I myself have on two occasions thought that I was about to kick the bucket while paddling. Neither experience was pleasant. For most people, the goal with paddling is to unwind, get some exercise, explore new places, have fun with friends, things like that. We don't take up paddling to practice our first aid, or to scare ourselves silly. So really, if you want to have fun, you need to be safe. If you have taken adequate precautions, you will be able to relax. When you relax, you can start to enjoy yourself. A word about rules. Rules are a good thing when you are starting out. Before you have enough knowledge and experience to develop your judgement, you can just trust the experts when they tell you things like 'always wear your lifejacket', or 'never paddle alone'. At best, rules represent the accumulated knowledge of the culture of recreational paddlers (at their worst, they become dogma, with scorn heaped upon those who don't follow the herd). That said, if you do enough paddling, you will find yourself in situations not covered by the rules. At these times, you need to be able to think for yourself. Before you even head out, you need to understand the risks associated with ocean kayaking—the real, objective risks out there in the world, not the subjective risks in your own mind. As the Tsunami Rangers of California are fond of saying, "We ain't afraid of nothin'! It's something we're afraid of!" For me, safety isn't about fear, it's about respect. Respect for the terrifying size and power of an ocean that I can never hope to conquer. If I am humble, and show my respect, make the correct supplications such as wearing appropriate clothing and carrying safety gear, maybe the sea will take mercy on me and allow me to go home at the end of each outing. So what are the real risks associated with paddling? It depends where you paddle. For some of us, it's cold water; for others, sharks or traffic or isolation and the difficulty of getting help should they need it. Take a long hard look at the risks. Educate yourself. Don't downplay the risks—they are real. Second, you need to know what steps you can take to reduce those risks. And believe me, there is a complete array of products out there to keep you warm, dry, floating, attached to your boat and paddle, and lots of gizmos to help should things go wrong, like flares, radios, and rescue equipment. The basic principle here is: as the level of risk increases, increase your precautions. A cell phone might be adequate for emergency communications in a city—an epirb might be more appropriate in the Arctic. Lightweight fleece clothing might work fine for summer paddling—a wetsuit or drysuit might be better if you're paddling in winter, or solo, or along open coast. The key here is to reduce the risk to a level that you are comfortable with. Some people have a very low tolerance for risk—they might not even try paddling. Others like to feel their hair stand on end, adrenaline surging through their veins. That's fine, part of the beauty of paddling is the freedom to make choices. Just be aware of your comfort level, and take adequate precautions. 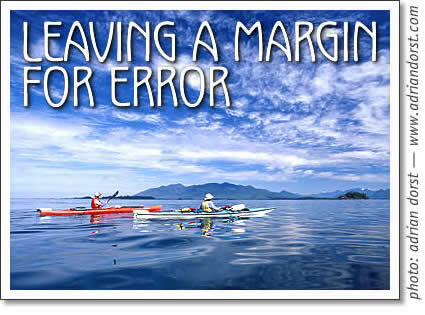 Don't forget to leave a margin for error—a thin layer of fleece might prevent hypothermia while you're in the boat—but what if you tip over? Equipment and skills play a role in your safety, for sure. But the key to safety is judgement. This may seem like a mysterious concept, but it's not. It's the ability to make good decisions. You need to answer this question: "Should I be on the water right now?" This question needs to be asked not once or twice a day, but constantly. If at any point the answer is no, get off the water right away. Better yet, come to that realization before you leave, and stay on shore. How do you answer this simple question? You need to understand two things. First, you need to understand the body of water you paddle on. This takes knowledge—which you can gain from books, magazines, videos, courses—and experience, which comes from spending time on the water. Next, you need to understand your own limits. Many people are in denial about their own level of ability. Typically, they tend to over-estimate their abilities. Set your ego aside, and consider the consequences of poor judgment. If you haven't already read it, read Deep Trouble. We don't all have to nearly die—we can learn from the experiences of others. Finally, you compare the conditions you expect (based on experience, charts, tide tables, weather forecast, guidebooks, and local knowledge), with the abilities of the weakest member of your group. If you don't have a good match, change plans. Paddle somewhere else that day. Cook blueberry pancakes—read The Adventures of Tom Sawyer aloud. Beware the deadly words 'we have to go'. You don't really—someone else will present that sales report, deal with that client. Wait bad conditions out, and live to paddle another day! It's important to find paddling partners who will respect your limits. Those most at risk are complete beginners, and experts. There is a benefit to having a range of paddling abilities in a group. The novices keep the hotshots well within their abilities, if their voices are heeded. And an expert within her limits can help novices who may be beyond theirs. Tofino kayak expert Dan Lewis writes about paddling safety and risk management in this sea kayaking article from Tofino Time Magazine.